There is a burly man in our back yard as I type this, and he is planting a tree! Of course, we are paying him to do this, it is not simply out of the goodness of his heart. 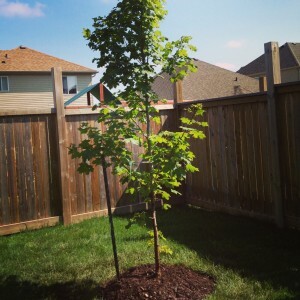 Have you ever BOUGHT a tree? It is remarkably thrilling. Now we get to watch with bated breath to see if we can keep it alive. We had a zero percent success rate with the lilac shrubs we planted in the spring (hence the professional tree planter in our yard). Mike and I have been watching the Canadian version of The Amazing Race, and it is incredibly boring. Nobody shrieks at anybody else, nobody complains about why there are so many poor people in Africa, nobody has any difficulties with any sort of language barrier. On this week’s episode, one of the teams CUTS IN LINE at the airport, and there is a great surge of outrage from the other teams, and the funny thing is they actually ASKED the people at the beginning of the line if they could cut before they did it, so it wasn’t even a true line cut. At first I was laughing at how incredibly lame this was, as far as reality TV drama, but then I started having Strong Feelings about the line cutting (I don’t think it is sufficient to just ask the people you’re cutting directly in front of, because, come on, you’re cutting in front of the WHOLE LINE) so maybe this is actually my preferred speed for reality TV. Maybe next week someone will set off fireworks in a residential neighbourhood on a day that is not approved by bylaw and I will REALLY get incensed. Ellie has recently discovered a passion for acrobatics, but thankfully not in a dangerous way — just the fairly benign kind where she hauls a stool over to the couch and then flops onto the arm of the couch and then flops again onto the couch itself. I wonder if there is a class we can enroll her in? Not, like, gymnastics or trampoline, but just a gym somewhere that is full of couches and stools. I think she’d really dig that. My parents’ gift to Henry when he was born was a tree planted in our yard. I found it surprisingly thrilling. I have been wanting to plant MORE trees ever since—and also fretting about Henry’s Tree, which is doing fine but I feel so much more responsible for it than for the trees that were already here.